A newly established scholarship will be awarded for the first time this spring to honor esteemed SFA art and filmmaking professor William Arscott. NACOGDOCHES, Texas - The Friends of the Visual Arts at Stephen F. Austin State University will award a newly established $1,000 scholarship this spring in honor of longtime art and filmmaking professor William E. Arscott. Arscott, who recently turned 83, is SFA's longest-tenured faculty member with more than 54 years teaching at the university. This scholarship is one of many the FVA has established to honor retiring art instructors. However, Arscott has no plans to retire soon. "Normally, the FVA Board only awards scholarships for a retired professor," FVA scholarship chair Linda Mock explained. "But we decided that Bill may never retire, and we want to honor him now. He has been generous in providing financial assistance to the gallery and supporting all our FVA scholarship fundraising efforts." The Arscott scholarship will be awarded on an annual basis to a junior, senior or graduate level student who is working toward an art degree with a major area of study in filmmaking. Arscott has worked in many artistic fields, including ceramics, painting, printmaking, sculpture and cinematography. For many years, while teaching cinematography, he also taught huge sections of art appreciation, and his lectures for these have been aptly described as "legendary," according to a Faculty Spotlight feature. 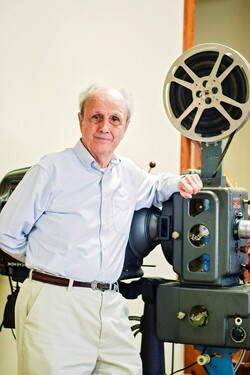 Arscott established the cinematography program in 1980. His primary artist activity is that of a movie producer, though he also does some work in painting and printmaking, the Spotlight article explained. Distinguished both as an artist and educator, Arscott has been recognized and awarded many honors, including Texas Senate Resolution No. 514, Outstanding Educator of America, Alumni Distinguished Professor and Regents Professor. Among his proudest moments was when Dr. Baker Pattillo, SFA president, recognized Arscott in August 2013 for his 50 years of service to SFA. Pattillo presented Arscott with a plaque proclaiming Aug. 22, 2013, 'William E. Arscott Day' at SFA. Today, Arscott spends most of his time teaching alongside one of his most famous former students, two-time Emmy-Award nominee Brad Maule, who portrayed Dr. Tony Jones on the daytime soap opera General Hospital for 20 years. Together, the two colleagues spend hundreds of hours a year teaching undergraduate and graduate students filmmaking, cinematography and production design. A testament to the program's commitment to graduating "camera-ready" professionals, Arscott said about 90 percent of the program's graduates are employed in the industry. "They leave us with the skills they need to excel," Arscott said in the Spotlight article. The FVA has established scholarships in the name of retiring SFA School of Art professors who were employed in the School of Art for a minimum of 10 years before retirement and who contributed in a significant way to the mission of the Friends of the Visual Arts board and its fundraising activities, such as consistently donating art for fundraisers, by providing monetary assistance, or by serving on FVA committees or board. The SFA Friends of the Visual Arts is made up of community members who support the arts in East Texas and provide monetary assistance to students enrolled in the School of Art to assist them with expenses incurred in producing the required exhibition for earning a B.A. or M.F.A. in art. The FVA also assists students with expenses related to attending educational trips planned by the School of Art or to attending conferences/workshops related to their primary area of study.